The tensions between Israel and Palestine are so deeply entrenched that any viable solution to the problem must consider a vast array of contending issues. There is unfortunately no panacea to these profoundly complex interrelations. This paper seeks to critically discuss the prospects of securing a feasible peace agreement between the Israelis and Palestinians in the near future. This will be done by acknowledging the problems and critically analysing the many theories as to how the conflict started and why it still continues today despite rigorous negotiations and the signing of a number of peace agreements. This analysis will look critically at the factors that have deepened the tensions between Israelis and Palestinians since 2008 as well as the status of the peace process at present. Additionally, the prospects of a two-state solution will be explored along with a discussion of the inclusivity of the overall negotiations to date and the prospects of a return to full-scale war between the warring nations. The possibility of reaching a sustainable peace agreement under present circumstances in the Middle East does not look promising however, there may be hope on the distant horizon. This paper will conclude with a debate about three potential future scenarios that could emerge vis-a-vis the Israeli-Palestinian situation. This paper will be analysing the Israeli-Palestine conflict in light of C.R. Mitchell’s (1981:35-46) definition of conflict. He says that conflict can entail as few as two people or include everyone on earth in the pursuit of desired goals which the individual or group recognises as being able to be obtained only by one, it could also involve one individual or group denying access to a resource or position from another group or individual. In this view, conflict arises in times of scarcity with regards to resources or positions of influence. Simply, it appears as though the logical way out of conflict would be the abolition of the “perceived incompatibility” between the groups or individuals through rigorous debate and cooperation by their representatives (Bar-Tal, 2000:351). However, long-standing conflict cannot hope to be solved this easily. After debate has begun, a process through which peaceful relations are formed on the basis of “mutual trust and acceptance, cooperation, and consideration of mutual needs” (Bar-Tel, 2000:351). But conflict resolution is never this simple, it requires a shift in the psyche of the feuding groups or an alteration in the conflicting attitudes especially due to the depth of entrenched animosity between Israel and Palestine. A few questions that may shed light on the issue are, ‘is there a values conflict between Judaism and Islam and does this play a role in the specific Israeli-Palestinian conflict? And, is tolerance actually possible?’ These questions will be answered in brief later in the paper. Lastly, it is necessary to point out that both religions, at their core, talk of spreading peace, prosperity and kindness so perhaps this could be used as a method of reconciliation with regards to finding common ground. The above must be understood in terms of what Mitchell dubs ‘conflict attitudes’. These attitudes are the psychological conditions which supplement and aggravate conflict scenarios (Mitchell, 1981:27). The conflict attitudes can also been understood as patterns of both perception and misconception that occur in, and arise out of, certain conflictual scenarios. However, this does not mean that these attitudes are causal features for conflict. They instead may be involved in the level of the conflict’s complexity and prolonged existence (Mitchell, 1981:27). These conflict attitudes make up the basis for Mitchell’s triadic structure for analysis of conflict; situation, behaviour and attitudes. With this understanding, the complexities underlying the Israeli-Palestinian conflict can be better observed with regards to the deep, intermediate and precipitating foundations on which the conflict has been built. The Israeli-Palestinian conflict is not a recent development but instead spans centuries and its so-called origins can be found in biblical literature. In Genesis 16 it details how Sarai, wife of Abram, told her husband to produce an heir for their family with the Egyptian handmaid, as Sarai was old and believed to be barren. Abram did so but also conceived with his wife 13 years later. The children were named Ishmael, son of the handmaid, and Isaac, Sarai’s son (Schafer, 2002:14). Genesis 16 explains that tensions grew between the sons and Isaac become the progenitor of the Jews while Ishmael become the progenitor of the northern Arabs. Ishmael and his mother were supposedly exiled to the south which is thought to have inspired the emigration of Muhammed from Mecca to Medina in 622 CE, the advent of Islam (Schafer, 2002:14). Other theories for the beginning of the conflict between the Israeli Jews and Palestinian Arabs include Pope Urban II’s crusades in 1095 CE. The pope thought he was getting revenge on Jesus Christ’s assailants, which he believed to be the Muslims, while in fact the German crusaders he commissioned were decimating Jews living along the Rhine (Schafer, 2002:15). Alternative theories place the blame on Charles Darwin whose theory of natural selection was twisted by “Social Darwinists” to insinuate that the Aryans were “inherently stronger” than the Semitic peoples and used this as leverage to encourage anti-Semitic campaigns. However, the ideologies of the German Jew, Moses Hess, seemed to solidify the idea that Jews should have a religious home base, Israel (Schafer, 2002:15). Hess began his writing and movement in the 1860s but they only gained interest in the 1880s with the writings of Leo Pinsker (Auto-Emancipation, 1882) who proposed a “secular socialist Jewish state”. Nevertheless, it was Nathan Birnbaum who consolidated this idea with the coining of the term, “Zionism” (Schafer, 2002:15). Zionism became a household term with the rise of Theodore Herzl’s literature. Theodore made an antagonist claim that “anti-Semitism was a psychosis and incurable” and that the root of the problem lay in the “abnormal condition of Jewish life” (Herzl, 1946:71). Herzl stated that the only means to rectify Jewish standing was “the removal of the cause through self-help and self-liberation”. One year after Herzl published his first book, Der Judenstaat, the Zionist Congress met for discussions on how to create a home in Palestine for Jews protected by law (Schafer, 2002:15). It is important to note that Zionism has not been accepted by the entire Jewish community for many reasons but the most compelling is that Jewish lore proclaims that a Jewish state “must not be established until the Messiah comes to lead it” (Schafer, 2002:15). This has not yet occurred. Much has been said about the history of the Jews, but what of the Palestinians? Where did they come from? Doumani (1992:8) writes that many people, including the Jews, believed before the arrival of the “first wave of Jewish settlers in 1881-84” that Palestine was in fact “empty”. This word “empty” represents the corporeal absence of “civilised people” and not the lack of a native population. This phenomenon can be recognised in the same way that the introduction of Christopher Columbus to America seemed to be. It is often said that Columbus “discovered” America when there was an already thriving indigenous population. This inherent racism is mirrored in the Zionist slogan, “a land without a people for a people without a land”. This is thus a display of a “wider European intellectual network characterized by chauvinistic nationalism, racial superiority, and imperialistic ambitions” (Doumani, 1992:8). This shows the entrenchment of the reluctance of the Jews to recognise even the existence of the “native population” of Palestinians. It is therefore not a surprise that the basic human rights of the Arabs continues still to be a problem of controversy (Doumani, 1992:8). Religious intolerance is often blamed for the conflict between the Israelis and the Palestinians yet, contemporary scholars disregard this is an easy way out of a long history of complicated feuding. The conquest by the Ottomans in 1516-17 saw the country divided into many different administrative districts. These included Jerusalem, Nablus, Gaza as well as Safad (Cisjordania) and Ajlun (Transjordan). The districts were all governed by one ruling authority, the Governor-General (beylerbey) of Damascus (Lewis, 1980:5). This area was known commonly as the vilayet, an area of administration dominated by Syria (Schafer, 2002: 16). Before the next conquest of this region by the British, Palestine was already acting as an “independent district of Jerusalem” and was not held accountable to any of the Pashas of the bordering regions (Lewis, 1980:6). Many years later, Palestine was captured by Egypt which held power from 1831-1840. This is important as at the time Egypt was busy building the Suez Canal which was completed in 1869 but led Egypt to insolvency (Schafer, 2002:16). At the same time, Zionist support was growing in Russia and spearheaded the movement to Palestine by much of the Jewish population. This small but growing population of Jews in Palestine was called the Yishuv. They were a group of mainly wealthy Jews that employed many Israeli workers. Bickerton & Clausner (2018:144) explain that the threat that the Arabs felt by the Yishuv dissipated quickly after realising that their people were still being employed, even by Jews, and continued to live life similarly to before. Interestingly, the biggest opposition group to the Jewish settlers at the time was by the Greek Orthodox Christians of Palestine. Schafer (2002:17) states that majority (almost 90 per cent) of the 40 000 new immigrants to Palestine during 1904 and 1914 did not stay due to the land being considered “inhospitable”. This means that at the end of 1914 there were only about 40 Yishuv living in Palestine however, they owned about 100 000 acres of land (Schafer, 2002:17). The ensuing years were met with an increasing animosity due to growing tensions and land scarcity until it culminated in a full blown war from 1948 until 1949 (Bar-Tal & Salomon, 2006:10). This war was thought to be about national identity however, it seems as though this was just one of many issues. There are two important things that support conflict; scarcity concerns and value issues. Value issues are those that cannot be mediated with money or, in this case, more land. The value issue in an Israeli-Palestinian context is based on nationhood. But how is this overcome? The concept of a two-state solution, which will be discussed later in greater detail, seems as though it will fail until this is sorted out. Perhaps the recommendation should be made that both groups recognise each other’s legitimacy at the same time. This may solve the values issue but not the scarcity issue. From a South African context, there is incredible racial tension prevalent in the country that is as a result of an approximately 300 year-long conflict. In this light, how can the approximately 1400 year old conflict (depending on the reader’s subjective definition of the start of the conflict) between Israel and Palestine expect to be resolved in the short term? Both the Israelis and Palestinians maintain that the tolerance of the others identity would “negate their own case” in that if each opposing nation was to be indeed considered a nation then it meant that the opposing group could not also be a ‘nation’ (Bar-Tal & Salomon, 2006:10). In this way, the development of phases in the conflict can be said to have had “intensified violence” leading up to the next war in 1967 which was fought over the West Bank and Gaza Stip. This along with the introduction of new ideological groups has led to the initiating of “new patterns of hostile interaction” between Palestine and Israel. Accordingly, the concern of this nationhood contestation is that it reinforces “territorial claims” and this implicates the fundamental disputes of each nation’s survival (Bar-Tal & Salomon, 2006:10). The division of Palestine into the State of Israel, the Gaza Strip and the West Bank (after the war of 1948-1949) helped define the competing claims to the land but also explained that the claims are not compatible if one group is to have ultimate sovereignty (Beinin & Hajjar, 2014:1). The Israeli Jews express their entitlement to the land from ancient religious scriptures found in the bible whereas the Palestinians base their claim to the land on longevity of their residency (Pressman, 2005:2). It is clear now that the conflict is saturated in both value issues, as seen above, and in scarcity issues. This will be covered in greater depth below. Before diving into the salient points of the debacle, what is meant by Mitchell’s triadic analysis of the conflict with regards to the deep, intermediate and precipitating causes? Firstly, the deep causes are attributed to the concerns that are seemingly far removed from the physical conflict itself however, are still deeply engrained in the historical settings that contributed towards the turmoil (Breuning, 2007:14). These can be thought of as the metaphysical concerns, that which transcends the physical. In the Israeli-Palestinian context these are the competing claims that arise from a deep-rooted biblical and historical entitlement to the land between the Jordan and the Mediterranean which both groups maintain are their rightful, ethnic homelands and cannot be shared (Yiftachel, 2016:233). Secondly, the precipitating features (the conflict triggers/ostensible causes) of conflict are those actions which contributed directly to the physical whereas, thirdly, the intermediate aspect of conflict lies between the deep and precipitating concerns. This can be better thought of in terms of ‘complacency in peace’ as well as complacency in individual leadership (Breuning, 2007:14). However, the intermediate aspects may distract from the deep causes which need to be resolved in order for conflict to subside. Additionally, it is useful to understand some of the other non-physical concerns, understood as the psychological factors, which perpetuate the resolve of the Israelis on the acknowledgment of the State of Israel. But on the other side of the conflict lies the Palestinian determination to end Israeli residency. Other examples of intermediate causes in context are the World War II Jewish genocide as well as the United Nations (UN) passing the resolution 181 at the end of 1947 which subsequently consolidated the divide of Palestine into an Arab and a Jewish state creating Israel (Pressman, 2005:2). The previous actions and increasing Zionism culminated in one of the most drawn-out conflicts of 21st century. This was again was intensified by the United Kingdom’s desertion of Palestine in 1948 as its protectorate resulting in many thousands of Arabs being displaced (Pressman, 2005:4). The English induced many wars and then simply left the newly partitioned countries. This was also characteristic of the English in many African countries and see in the divide of Pakistan and India. 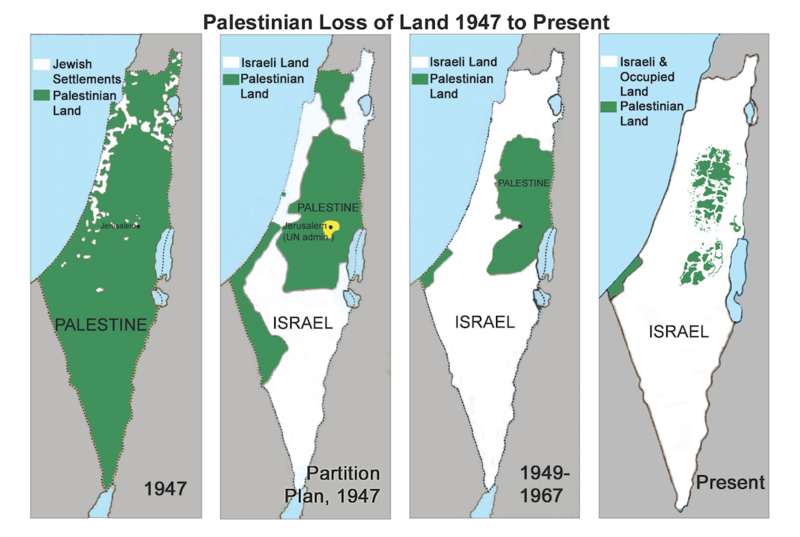 In figure 2 below, it becomes clear why there is such a prolific sense of increasing hostility due to the territorial expansion of the Israelis since 1947. Therefore, to reiterate the earlier mentioned point, in terms of the Israeli-Palestinian conflict the goals that each side seeks are mutually exclusive. This is not a good prospect for future peace. Mitchell further highlights that scarcity plays an important role in understanding and resolving conflict situations. Scarcity implies that the said resources is limited and perhaps cannot be shared in abundance. This is exactly the case for the Israelis and the Palestinians with regards to the land that is being fought over. This scarcity is unable to be shared or extended to incorporate both groups’ desires. Because of the significance of the disputed territory in the identity of both cultural groups, what can be established is that there is no way to equally distribute this good. This is exacerbated by the perceived goal incompatibility between the contending groups. Thus, it becomes clear that the foundations on which this conflict has developed are the contending claims to the land as both groups desired ethnic base. WHAT FACTORS HAVE MAINTAINED THE LENGTHY DURATION OF THE CONFLICT? It is clear now that any attempt at conflict resolution is undermined by the very nature of the contending parties and their resistance to compromise. All attempts at peace talks between the Israelis and Palestinians have ended up veering off into the opposite direction from the intended goal. When Mitchell speaks about conflict behaviour he is discussing the actual behaviour of the various groups and their means of accomplishing their desired aim. However, this behaviour does not have to be violent for it to be considered conflictual (Mitchell, 1981). The author suggests that what requires further attention are the issues pertaining to the destabilisation of the peace talks. The reason that a two-state solution is being sought is because it means that both parties consent to the agreement and it is not simply one group against the other but both groups deciding to do something to make inroads. Again, Mitchell’s triadic conflict structure will be used to analyse and understand why the peace talks have seemingly failed. Looking as far back as the Oslo Agreements of 1993, one can notice that attempts at a two-state solution simply exacerbate tensions. This agreement aimed at getting both parties to recognise the other’s identity and human rights (Kelman, 2007:290). This expected success in fact failed due to the non-committal behaviour on both sides. Both parties hesitation resulted in no solution being agreed upon. This is an example of Mitchell’s sentiments about some behaviours that are non-violent in nature creating further tensions. Following the events of 1993, a new set of peace talks come into being in 2000. These were the Camp David II negotiations which ambitiously pursued an end to the conflict once-and-for-all (Rosenberg, 2011:2). However, this re-attempt at a two-state solution also failed. The discussions were ill-met by both the Palestinian political leader, Yasser Arafat (former chairman of the Palestine Liberation Organisation) and Ehud Barak (Politician from the Israeli Labour Party). Unsurprisingly the downfall of these talks was spurred on by the incompatible desires of both Arafat and Barak (Rosenberg, 2011:4). It appears as though a two-state solution is not a viable option at present or in the near future. There have been some very interesting occurrences since 2008 in light of the developments of the conflict. Between 2007 and 2009 the continuation of the peace talks also proved futile. At the end of the 2007 talks the ceasefire crumbled and more conflict began raging. This eventually led to the war of the Gaza Strip in late 2008 which was followed by further discussions which were all carried out in vain (Migdalovitz, 2010:19). This war, which is also known as the Gaza Massacre or Operation Cast Lead, was a highly tense three-week long conflict. It is estimated that the Israeli Defense Force (IDF) killed 14000 Palestinians while only 13 Israeli deaths were documented. The fury and outrage of the rest of the world was felt as far as South Africa and saw Richard Goldstone, South African Judge, blame the IDF of both crimes against humanity and war crimes. In 2013, for the first time since 2010, the Israelis and Palestinians met for further peace talks (McClam, 2015). Polls held at this time indicated that “sizable majorities” of both the Israelis and Palestinians called for a two-state solution. This seemed to be a breakthrough at the time with both groups recognising each other’s need for legitimacy in making headway. But unfortunately this was only followed by a wave of violence which became so heated that the period of conflict between 2015 and 2016 has now been called the “Wave of terror” or “Intifada of the Individuals” by the Israelis. The most recent turmoil was spiked by American president Donald J. Trump intervening and essentially showing solidarity with the Jews. Many have criticised this move as being a ‘flexing of his muscles’ so to say and a continuation of his infamous bias against Arabs and Islam. Trump made a “bold” move and relocated the American embassy from Tel Aviv to Jerusalem (Cohen-Almagor, 2017:2). This move also helps to gain clarity on the Israeli Legalisation Bill which is said to hinder the possibility of a two-state solution. Cohen-Almagor (2017:7) claims that there are three ways in which the United States could make a measurable difference to the conflict if they so decided to get involved. The first suggestion is to agree with the right-wing Israeli’s idealistic option which would reinforce the Jews at the expense of Palestine (a one-state solution). Secondly, Trump could encourage the optimal option of confederation. This would entail Jordan and Egypt creating a federation with Israel but it can only be realised when certain things have been built; “trust and good will of all concerned nations” (Cohen-Almagor, 2017:9). Thirdly, Trump could support what Cohen-Almagor (2017:7) says is the most realistic and least violent option of a two-state solution. These options must be seriously considered as viable courses of action as America has an undeniable influencing power. As of 16 September, 2018, the Council on Foreign Relations states that the current status of conflict in the Middle East and Africa is unchanging. It discusses the recent developments of the Israeli-Palestinian conflict and details that during the months of March, April and May 2018, the Gaza strip was experiencing weekly demonstrations, these took place at the Israeli border. The majority of the demonstrators were peaceful however, the few who were not attempted to “storm the perimeter fence” and launched rocks and varying other items. The result of this is that the IDF has killed 86 protestors and hurt another 3700 (CFR, 2018). Other developments in May showed that the fight between Hamas (acronym: Ḥarakat al-Muqāwamah al-ʾIslāmiyyah Islamic Resistance Movement) and the Israeli military has become the “worst period of violence since 2014” (CRF, 2018). A cease-fire was eventually reached but not before the Gazan demonstrators had fired more than “one hundred rockets into Israel and Israel responded with strikes on more than fifty targets in Gaza” (CRF, 2018). With regards to official negotiations at present, both Israel and Palestine signed an agreement in 2017 following the previously slow reconciliation (CRF, 2018). Not much has occurred since. However, there is a rising concern that has been highlighted by the Conflict Global Tracker (2018) that a third intifada may arise and following which renewed tensions may increase into “large-scale violence” or a return to a full scale war. Hopefully the current stalemate will be nullified by American intervention (seeing as Trump has continued to demonstrate an interest in the area and in supporting America’s Israeli allies) and not overturned into more violence. In order to fully understand the peace process at present, it is necessary to look more closely at the inclusivity of the talks. Have the correct parties been brought to the discussion table? Many intellectuals criticise the peace talks for not including women and/or civil society in formal debates. This is thought to be a defining feature of the failed peace talks (Jadallah & Mrabet, 2012). In brief, excluding civil society actors, who are often some of the most devoted to making measurable and tangible change, means that they are powerless in sharing their opinions on the pertinent issues which could potentially aid in the peace process. Excluding the people being most effected by the conflict denies the opportunity to get ground-level insight and understanding. Jadallah and Mrabet (2012) make the claim that a new approach is in order. An approach that recognises the downfalls of previous talks by including “all societal groups in working toward a viable peace” (Jadallah & Mrabet, 2012). The recommendation therefore is to enable high-level actors to participate meaningfully with women and civil society groups. The lack of inclusivity in the talks is well recognised however. Another aspect of the lack of inclusion is with regards to the group Hamas. Hamas is seen to be the credible representative of the Palestinians however, Hamas has been labelled a terrorist group by the international community. This refusal to embrace Hamas in negotiations displays a lack of engagement with the legitimate representatives of the Palestinian people. Thus, any peace talks and agreements that arise without the inclusion of Hamas is likely to fail. Therefore it appears that there may be only three probable situations in which the conflict may continue, or be resolved. These situations are; a one-state solution where Palestine and Israel combine to create a type of peaceful/unified state. Next, a two-state solution may arise, even though it has proved unsuccessful in the past. And thirdly, one group may completely wipe out the other and create an exclusive state. Point three deals primarily with scarcity and not value issues. Something that needs more attention, but lies out of the scope of the paper, is the question, “who benefits from the conflict?” Once this is understood those identified actors or individuals can be better monitored and perhaps small radical and extremist attacks can be better managed. These attacks, however small, can set back peace talks tremendously. Those who support a single-state solution make note of the things that obstructed the success of a two-state solution. One of the concerns is that Palestine may not prosper as economically as Israel as their territory is small in proportion and “disjointed” (Habib, 2016:194). However, the one-state solution suggests that its success will be won by radically mitigating the concern of imminent conflict. This, they claim, is due to their single state considerably increasing the opportunity cost of pursuing conflict with each other. However, exponents of a two-state solution oppose this by saying that Israel is unlikely to concede its nationhood to Palestine due to the risk of charges against them held by the International Criminal Court (ICC) (Habib, 2016:195). On the other hand, Palestine is “politically fragmented” and their official party is not supported by Hamas. These two need to be in agreement for a deal to take place (Habib, 2016:194). Despite the literature, it must be noted that neither Palestine nor Israel at present want a single-state solution. There is not enough trust between the two nations for the possibility of a functioning single-state solution (Miller, 2016:448). Establishing a two-state solution has in the past been supported by the international community as it is thought to decrease the potential of “state-to-nation imbalances” which could come to the fore by one nation dominating the other. This would most likely see Israel subdue the Palestinians (Miller, 2016:449). However, as a result of asymmetries in power, a return to a full-scale war appears to be improbable especially seeing that the international community is keeping a close eye on human rights violations. An example of this is the recent Israeli threat of the “imminent demolition of a Palestinian village in the occupied West Bank” (Global News Podcast, 2018). Israel has been warned against the attack by top academic intellectuals as the destruction of the village would breach international law as the Bedouin village lies at the heart of a key area of the West Bank. The Israelis state that the village was built without permission (Global News Podcast, 2018). In accordance with the ‘Ripeness Theory’ (this looks at the necessary settings in order for peace to be fostered) the territory of contention seems doubtful to reach consensus in the near future. Habib (2016:197) states that the nations cannot agree on a two-state solution until both groups recognise that increased violence will not result in a victory for the one or other, this is also known as a “mutually hurting stalemate”. The above plus the lack of legitimacy of Palestinian opinions in the talks increasingly diminishes the chance of a resolution. Out of these conditions the third potential scenario emerges, a continuation of the stalemate due to the reluctance of both the Israelis and the Palestinians to participate in further peace talks. This paper has attempted to answer many complex questions and aid the reader to gain insight into the ethnic and religious dynamics of the Israeli-Palestinian conflict in light of C. R. Mitchell’s conceptualisation of conflict and triadic conflict structure. These tools have been used in order to establish sound arguments while critically discussing the current status of peace talks, the duration of the conflict and, the potentiality of a return to full-scale war. This has been done with specific reference to the salient causes of the conflict while keeping in mind the perceived incompatibility of the Jews and the Arabs to both attain their desired goal of staking claim to their holy land. In sum, the recommendations that have made above are: to increase the inclusivity of the peace talks to include women, civil society and Hamas while enabling high-level actors to participate meaningfully; to use the fact that both Judaism and Islam promulgate peace as a point of departure for reconciliation; both groups should be encouraged to simultaneously recognise each other’s legitimacy and finally; Trump must be cheered on to support what Cohen-Almagor (2017:7) says is the most realistic and least violent option of a two-state solution. At this present moment a stalemate has been reached however, the future of the conflict can go one of three ways; the conflict may continue to be intractable or, the occasion may arise to deliberate a situation in which a two-state solution may be presented. The latter is a positive potentiality that appears to be unlikely but still possible. This unlikely outcome is spurred by the inflexibility of attitudes of both parties to negotiate. Lastly, another unlikely option, but again still possible, would be a single-state solution to the conflict which could prove to be durable. This is also at risk due to rigidity in negotiations. It is thus possible to evaluate and make sense of the Israeli-Palestinian conflict but, in order to do so, it is important to appreciate the depth of the complexities of the contending ethnic groups as well as acknowledge personal bias and to keep up to date with present altercations and peace processes. Finally, the author maintains that in the short term a solution does not seem viable however, the situation may be contained while in the long run, there is a need for changing values. Bar-Tal, D. 2000. From Intractable Conflict through Conflict Resolution to Reconciliation: Psychological Analysis Political Psychology, 21(2):351-365. Bar-Tal, D., & Salomon, G. 2006. Israeli-Jewish Narratives of the Israeli-Palestinian Conflict: Evolvement, Contents, Functions and Consequences. In R.I. Rotberg (Ed.). Israeli and Palestinian narratives of conflict: History’s Double Helix. Bloonington: Indiana University Press. Beinin, J. & Hajjar, L. 2014. Palestine, Israel and the Arab-Israeli Conflict: A Primer. Washington D.C.: MERIP Press. Bickerton, I. J. & Clausner, C. L. 2018. A History of the Arab-Israel Conflict, eighth edition. New York: Routledge. Breuning, M. 2007. Foreign Policy Analysis: A Comparative Introduction. California: Sage Publications. CFR. 2018. Global Conflict Tracker [Online]. Available: https://www.cfr.org/interactives/global-conflict-tracker#!/conflict/israeli-palestinian-conflict. [2018, September 16]. Cohen-Almagor, R. 2017. President Trump and the Israeli-Palestinian Conflict [Online]. Available: https://papers.ssrn.com/sol3/papers.cfm?abstract_id=2931308. [2018, September 14]. Doumani, B. B. 1992. Rediscovering Ottoman Palestine: Writing Palestinians into History. Journal of Palestine Studies, 21(2):5-28. Global News Podcast. 2018. Episode: 17 September (24 minutes 33 seconds). The BBC Global News Podcast [Podcast]. [2018, September 17]. Habib, S. 2016. Too late for two states: the benefits of pivoting to a one-state solution for Israel and Palestine. Journal of International Affairs, 69(2):193-203. If Americans Knew. 2012. A Synopsis of the Israel/Palestine Conflict. [Online]. Available: http://ifamericaknew.org/images/FourMaps2.png. [2017, September 9]. Jadallah, A. A. & Mrabet, Y. 2012. An Inclusive Peace Process for the Israeli-Palestinian Conflict. Washington: The Institute for Inclusive Security. Kelman, H.C. 2007. The Israeli-Palestinian Peace Process and its Vicissitudes: Insights from Attitude Theory. American Psychologist, 62(4):287-303. Lewis, B. 1980. Palestine: On the History and Geography of a Name. The International History Review, 2(1):1-12. McClam, E. 2015. A guide to the 2013 Israeli-Palestinian peace talks [Online]. Available: https://www.nbcnews.com/news/world/guide-2013-israeli-palestinian-peace-talks-flna6C10791311. [2018, September 15]. Miller, B., 2016. srael–Palestine: One State or Two: Why a Two- State Solution is Desirable, Necessary, and Feasible. Ethnopolitics, 15(4):438-452. Mitchell, C. R. 1981. The Structure of International Conflict. New York: Palgrave MacMillan. Pressman, J. 2005. A Brief History of the Arab-Israeli Conflict. Connecticut: UCONN Press. Rosenberg, R.S. 2011. Why Camp David II Failed: A Negotiation Theory Perspective. Massachusetts: HNLR Press. Schafer, D. 2002. Origins of the Israeli/Palestinian Conflict. Humanist, 62(4):14-18. Yiftachel, O. 2016. Ethnocracy: Land and Identity Politics in Israel/Palestine. Geopolitics, 7(2):215-248.